When you say words like raccoon, pecan, hurricane, hammock, and jerky you are saying words that have entered English from Native American languages. Indigenous languages live on today not just in words like these, but as the means of everyday communication for millions of people in communities throughout the hemisphere. 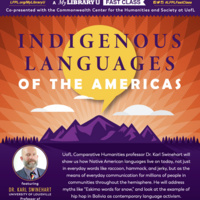 Linguistics professor Dr. Karl Swinehart of UofL's Department of Comparative Humanities at the University of Louisville will give an overview of languages of the Americas in terms of their grammatical features, address myths like "Eskimo words for snow," and look at hip hop among Indigenous youth in Bolivia as an example of contemporary language activism. This class is free and open to the public, but registration is requested. Call (502) 574-1623 to reserve your spot.